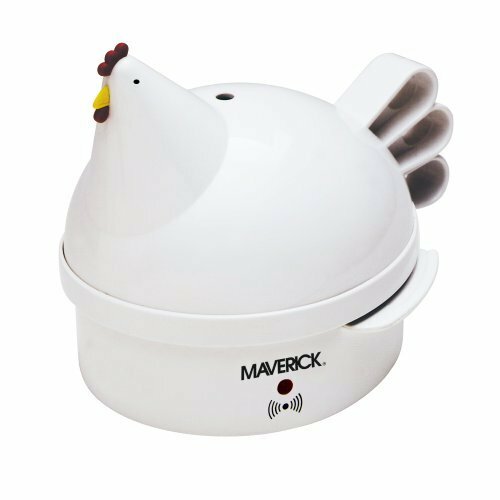 Hard Boiled Egg Cooker review – One of my very favorite kitchen gadgets is my hard boiled egg cooker. I generally whip up a batch of eggs on Monday and snack on them throughout the week. Eggs are packed with protein so they help keep hunger at bay. I often peel a few and pop them in a baggie with a little salt and pepper for a healthy on the go treat. A hard boiled egg cooker makes it easy to make hard boiled and soft boiled eggs while I am doing other things (instead of watching a pot boil). In the olden days, to enjoy a yummy hardboiled egg, you had to boil water on a stove, than cook the eggs in the water, keeping an eye on the pot to make sure it did not boil over . To enjoy a soft boiled egg, was a messy procedure, with it being very hard to judge how long to cook the egg, so as not to overcook, or undercook. Having undercooked eggs can be dangerous, and overcooked eggs can be unpleasant tasting. Now, it’s so easy to make eggs without the hassle, cook time, or clean up. There are so many hard boiled egg makers in the marketplace that help chefs, moms, students, and office workers make eggs in a quick, easy, and non messy way. 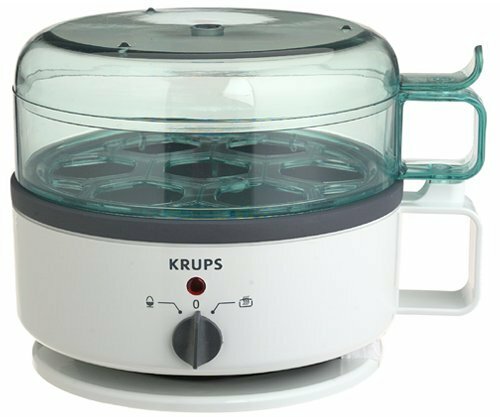 Egg Genie, Krups and Cuisinart have great egg cookers, to name a few. Different egg makers offer different features. The Cuisinart Egg Cooker, Egg Genie Electric Egg Cooker and Krups Egg Cooker work very similarly. With this hard boiled egg cooker you simply place a small amount of water into the basin. You will then put a small hole into the top of each egg, using the puncture feature on the bottom of the water measuring tube it comes with, and place the eggs into the device. Close the lid and press start. Your eggs will cook for about 10 minutes, then will be completely ready for you to eat. You don’t even have to worry about the hassle of the stove, and it’s great for college students in a dormitory situation that don’t have a kitchen to use. The Eggiessystem uses individual plastic, egg shaped containers for the eggs. Simply crack your egg, place in the egg container, and into a pot of boiling water. After your eggs have finished cooking, you can remove the containers from the water, and remove the eggs. Reviews on the Eggies system are mixed,with some saying the way it works is a hassle. You can read reviews here; Eggies Reviews. You can also hard boil or soft boil your eggs with these methods, depending on cook time and amount of water used. Don’t forget, that the Egg Genie and Cuisinart also allow you to poach your eggs, a great feature for making eggs benedict or to be served with toast for a quick, nice breakfast before starting your day. You can also never over or undercook your eggs, as the machine sounds a loud alarm and flashes an indicator light when eggs are finished cooking the correct cook time. Both machines can hold up to 7 eggs at once. In addition to electric cookers and the Eggies system, you can buy microwave egg cookers. Nordic Ware makes one for under $12 that has rave reviews. You can learn more about it here; Nordic Ware Microwave Egg Cooker. Depending on retailer, you can purchase the Egg Genie for about $20, the Cuisinart for approx. $30, and the Eggies at under $10 for 6 containers. Enjoy eating your yummy hard or soft boiled eggs, quicker and easier than ever before! If you enjoy eggs, a hard boiled egg cooker is affordable and very functional. Previous articleJuice Fasting & Raw Foods: The most effective weight loss plan!